I was just about to upload pictures of my latest project, when I noticed that the post count was 299. So this must be the 300th post. No, really. I also realised that the blog has been running for a little over 5 years - I started writing back in June 2008. I feel like I should celebrate in some way, but I am fresh out of party poppers. Oh well, a picture of a couple of partying zombies will have to do, they look very merry. Looking back, it's been a good five years for painting. Technically, I have improved by tiny amounts each year, I can see the difference in close-up. The biggest leap I have made is to continually try new techniques and methods. I think my best achievement has been to develop a system that allows me to paint to a consistently high standard in a reasonable time span. In gaming terms, the past year has probably been the best of the lot. Again, this is mostly down to trying new things. Saga and Lord of the Rings strategy battle game have both breathed new life into my gaming habits, these are both skirmish games that I would highly recommend if you have yet to try them. I have even been inspired to start developing my own little system! Expanding on all these little teasers will keep me busy for a few posts. Sometimes I feel like I flit from one thing to another, but it keeps me inspired. Over time, an odd month here, another month there, and the armies mount up. In five years I have expanded my chaos armies, my orc and goblin army and my dwarf army. I have started a wood elf army and (another) vampire counts army and got both of them to a playable size. I have built up a small collection of terrain. I have extended my interest into three or four new games and added a few forces to support them. Yet I still feel that's just the tip of the iceberg. On to the next 300! The last couple of weeks have been hot in the UK. Officially, it's been a heatwave, the papers have been full of pictures of crowded beaches, ice cream munching kiddies and cartoon suns wearing sunglasses. Yep, we really are obsessed with the weather in this country. The temperature in my neck of the woods reached 26C on a couple of occasions. Now, to those of you living in really hot places, you are probably wondering what the fuss is about. The problem is, we in the UK have houses to keep us warm and dry from the usual damp and cold weather, so air conditioning is not the norm. Double glazing and cavity insulation to keep us cosy, oh yeah, but not much to cool us down when we have a hot spell (once every seven years it seems). So, it's been hot and sticky - and that can be difficult when you want to paint. My solution was to switch to some assembly projects, no paint required. But also to whip up a few items I had been putting off for some time. Some easy things to slap on a base coat, wash and drybrush, then maybe a little glazing. These walls and fences fit the bill. Essential items that we often overlook when painting our hundreds of figures, but something we probably should pay more attention to. Obstacles such as these can make a huge difference in game, so I am glad that I dug them out and whipped them into shape. Next on the terrain list, a chapel and graveyard, but hopefully quicker than seven years from now! The grave guard unit is finally ready for gaming. 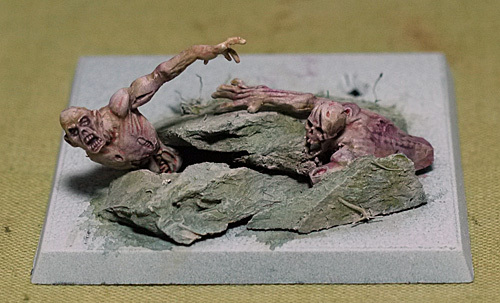 The main inspiration came from the Skyrim game; the skeletal denizens of many a dungeon known as draugr, as I mentioned in a previous post here. The models are the plastic army of the dead from the Lord of the Rings game. I am really pleased with the way they have turned out. 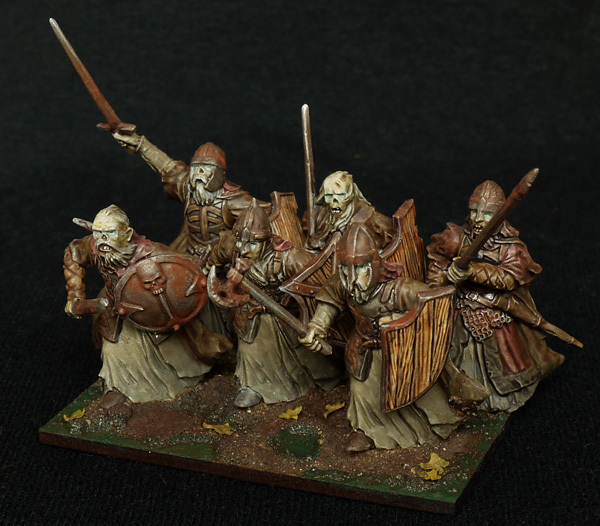 The mdf bases are 60mm x 40mm, from warbases. I have multi-based them like this because they are easier to store and with one eye on future gaming such as Hail Caesar or Impetus. 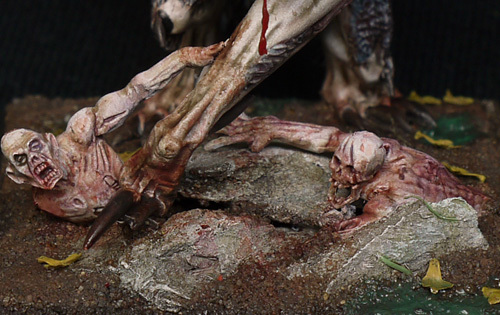 If I play Warhammer I will use a marker or dice to count wounds. The figures are surprisingly big, I know I was surprised when I opened the box - fitting them on the bases was a challenge. When I attached them to the bases I also made them more upright, which adds a little more to the height. It's worked out perfectly, as the skeleton figures will be smaller and thus the size differential will help to make battlefield recognition easier. The fact that these figures are heavily armoured and robed also helps them to stand out from the common skeleton warrior. The banner I copied from the Skyrim game, painted on to a piece of foil from a wine bottle. This can be bent into a billowing banner, as hopefully you can see in the picture. Now that I have another regiment painted for the army, I can treat myself to a character model. Next up is a varghulf, not strictly a character as such but a welcome treat after the regiment. Here's a work in progress shot of the base, it's been sat like this on my bench for several months. 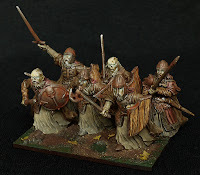 It's good to be painting figures for a fantasy army again, I miss the creativity and personal vision that seems lacking from historical subjects. I am making slow progress on the grave guard unit, hampered by the heat as much as anything. I did also divert slightly and paint a set of walls and fences, but it's been slow going for the past few days. All the basics are finished, with some rust and weathering and fine details still to be done. The light for photos is not ideal - extremely bright light is not good for painting, or photography, give me cloudy overcast weather any time! So I have added a mist effect to the work in progress shot, to add a little atmosphere. Hopefully the next update will be the unit finished. 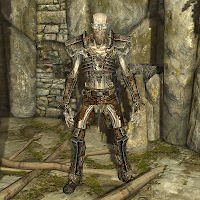 The draugr unit is on the march. 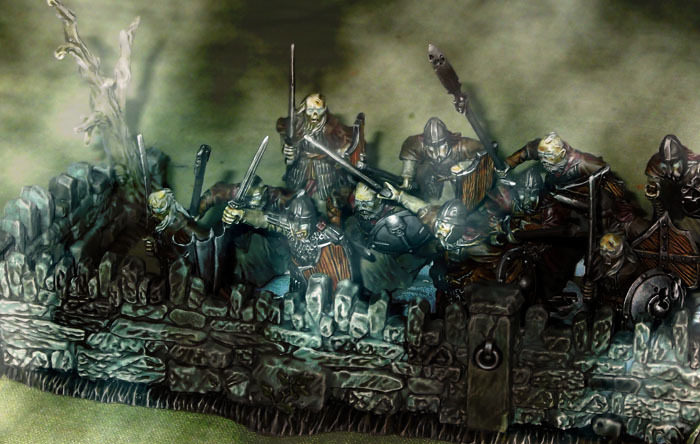 As you probably guessed from my previous hint, the upcoming grave guard unit have been built from the plastic Lord of the Rings army of the dead figures. Excellent figures they are too, with lovely detail on the armour and robes, as you can see here. Faced with a lot of figures to paint, I wanted to blitz through the robes in double quick time. Painting a base coat, then washing, then highlighting was out of the question. I tried something a little different on this unit. First, I primed white, then washed with a black and brown mix to give elementary shading. Then I glazed over this with a light brown to give some colour. My original idea was to repeat the glazing several times to build up the colour, moving more to the folds to increase the shading in these areas. But I realised this would take a long time and require a lot of care, something I try to avoid when painting large regiments. So instead, I took a chance and took radical action. I mixed up some MIG pigment in matte varnish, thinned it with water and whacked it on quickly with an old brush. When it was semi dry I ran a damp brush over the edges to remove the pigment and leave a roughly highlighted crease. The result is decent enough for a regiment, now I just have to get the armour and the details painted. 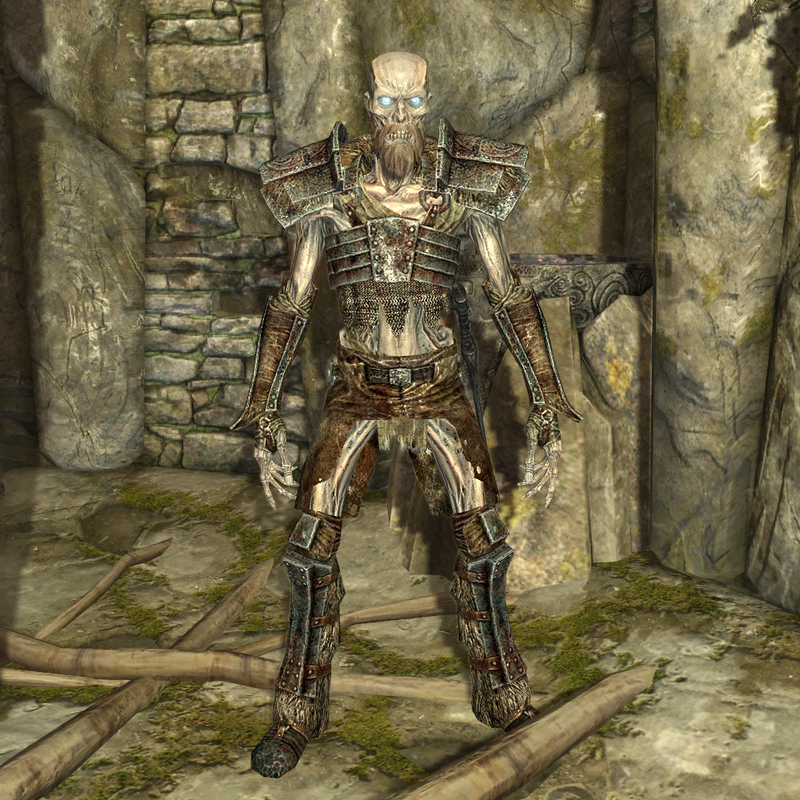 If you played Skyrim, or in the less likely event that you are a scholar of Scandanavian lore, then Draugr will need no introduction. They are undead creatures from Norse/Icelandic mythology, guarding their treasures and/or tombs. More information can be found on wikipedia. I loved Skyrim when it was first released, for so many reasons - Norse mythology, viking runic aesthetics, a dark and "real" palette. Delving into dungeons and fighting against skeletons and draugr was one of many highlights, hardly surprising given my many years of collecting and playing Undead armies. If you are a Tolkien fan, you will know that the Undead play a part in the written work, even if the film trilogy omits much of this. The hobbits have many adventures on the road before they reach the inn at Bree, including an encounter with a barrow wight in a foggy tomb on the downs. If you are a Warhammer fan, then some of this will sound vaguely familiar. 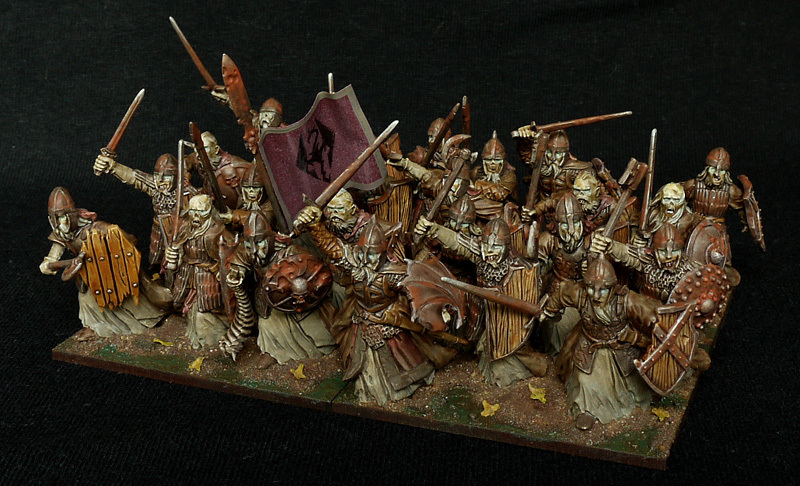 Wights were, at one time, a unit in the Undead army. When this army was split into two books, the Vampire Counts army list gained Wights as characters and a pseudo-wight unit now known as grave guard. There's so much from folklore and mythology that ends up in fantasy gaming like this, I think this is one reason why I was drawn to it in the first instance.